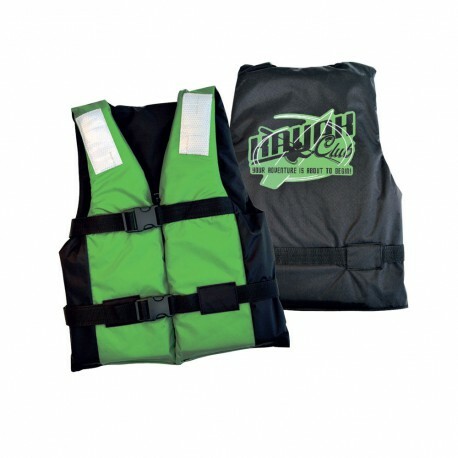 CHILD LIFE JACKET 50N CE ISO 12402-5 2 STRAPS/CHILD. Buoyancy aid. Weight: 25 to 40 kg. Chest: 65 to 80 cm. Buoyancy "CORFU '50N EN ISO 12402-5 WITH 2 BELTS. Suitable for all types of sailing and other water sports. Its design is elegant and it is made of highly resistant nylon fabric. It is approved by the last European rule EN ISO 12402-5 to aid buoyancy of 50 Newton. SOLAS reflective tape available, and all materials used in its construction have been approved according to the European standard EN ISO 12402-7. It is available in 2 sizes, in black and green color with a pattern on the back.